Darul Hadis Latifiah > News > news > DHL ANNUAL SPELLING BEE! 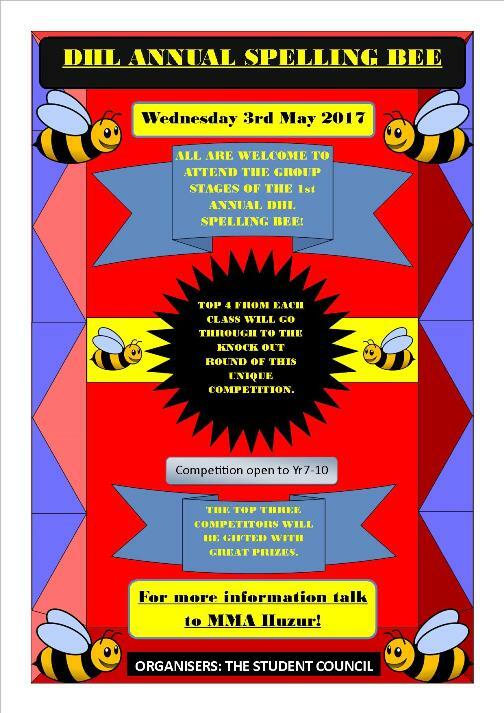 ALL ARE WELCOME TO ATTEND THE GROUP STAGES OF THE 1st ANNUAL DHL SPELLING BEE! TOP 4 FROM EACH CLASS WILL GO THROUGH TO THE KNOCK OUT ROUND OF THIS UNIQUE COMPETITION. THE TOP THREE COMPETITORS WILL BE GIFTED WITH GREAT PRIZES. For more information talk to MMA Huzur!